How do artists create meaningful images when one component of their brain is analytical and the other is intuitive? In an earlier post focused on Daniel Heimlich, I proposed that his arrangement of subject material matches the constructs of the Foote, Cone and Belding Grid in engaging the viewer’s left and right brains' functions. For the present discussion I will move the focus away from the concept that the analytic and intuitive leanings of our divided brain prefer certain arrangements of imagery and focus on how these two propensities of the brain impact on the way that artists’ make images. 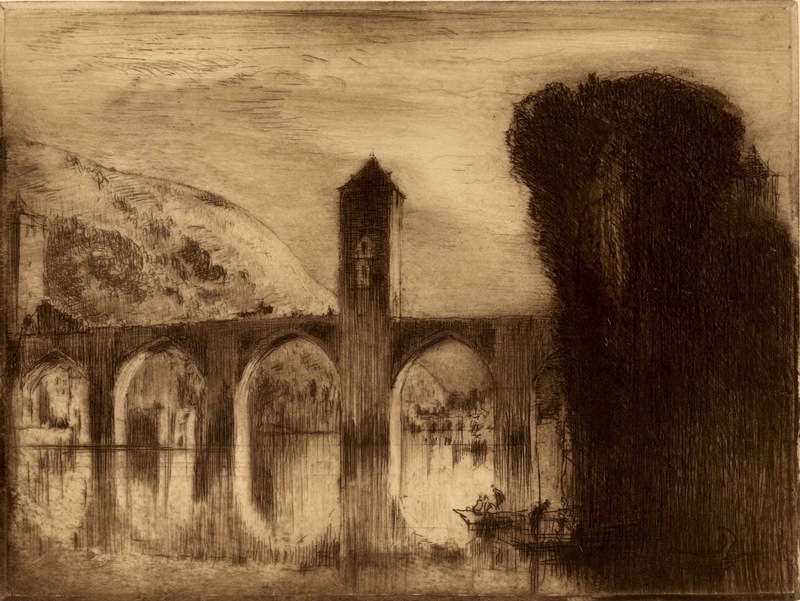 More specifically, I wish to discuss how Sir Francis Seymour Haden (1818–1910) and Sir Frank Brangwyn (1867–1956) present their very different ways of looking at subjects into coherent images. Before exploring these artists’ approaches I must clarify that the following explanation is based solely on what can be seen in the prints examined rather than being based on privileged knowledge about these artists’ motivations and intentions when they made the images. At first glance, Haden's etching, Thames Ditton—with a Sail (shown below) may appear to be an easily understood image. Essentially, the immediate foreground shows the broken remains of a tree trunk. 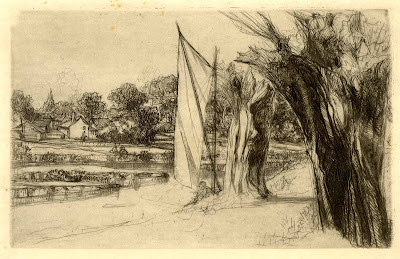 The left silhouette edge of this tree creates an arching rhythm leading to a sail strung loose on a mast with water behind it stretching back to a cluster of houses in the distance. On a closer inspection, however, this initial reading of the scene is not so straight forward. The foreground tree is not an objective representation of what Haden would have seen (see detail further below). For instance, the treatment of its upper region is far from being an accurate description of bark and twigs. But this does not mean that the drawing of the tree is inappropriate. It is a wonderful tree. From my standpoint the treatment of its representation with a web of seemingly searching marks expresses clearly Haden’s emotional response to the non-visible spirit of the tree. 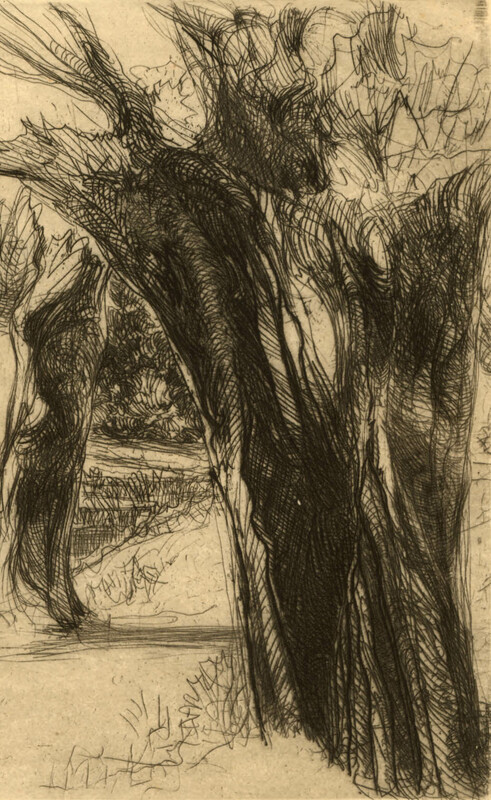 Just as important, this very subjective rendering of the tree juxtaposed beside the mimetic treatment of the rest of the image projects a mood of unease arising from the note of discord the contrast between the two drawing styles creates. 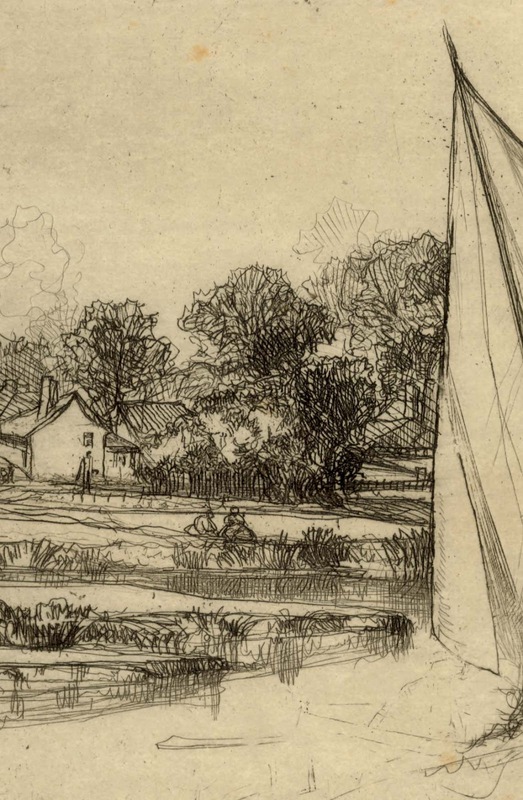 What Haden exemplifies in this print are two essential ways of drawing. One way is by visual representation of superficial appearance arising from the left brain processes, as exemplified in the mimetic rendering of the landscape beyond the foreground tree. This approach also involves the mechanics of drawing (e.g. perspective, sight-size measuring, construction of shadows. reflections and all the other subtleties of portraying form) in a very conscious and disciplined way. In short, this approach is to create what may be described as “pictorial space”—a space of three-dimensional illusions. 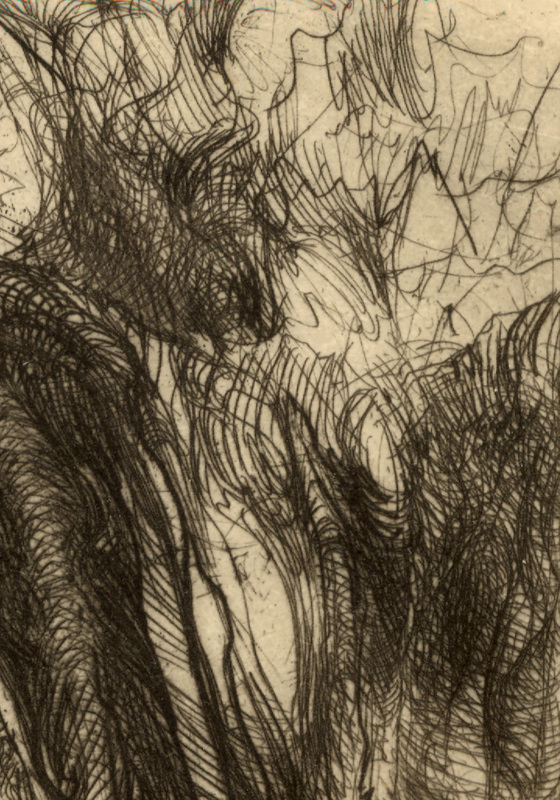 The other way is by analogue representation of essentially non-visual experiences arising from right brain processes, as exemplified in the web of gestural marks describing the foreground tree. 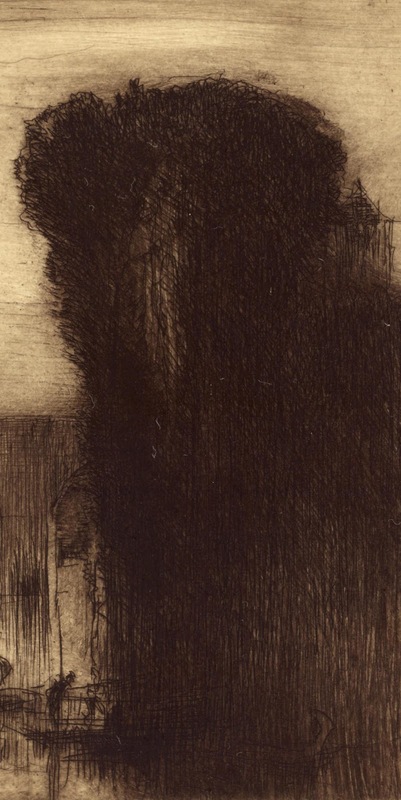 This is a more intuitive approach wherein artists configure their gut feelings about a subject into marks, shapes and rhythms onto the drawing support. This concept of intuitively sensing the subject and configuring the drawing to match the experience may be described as “graphic space”—a space of synthesised ideas and non-visual feelings. 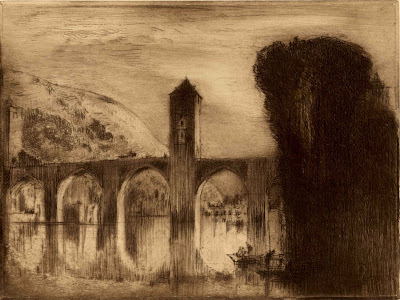 These two spaces—pictorial and graphic—are equally evident in Brangwyn’s remarkable etching, Le Pont Valentre, A Cahors (shown below). 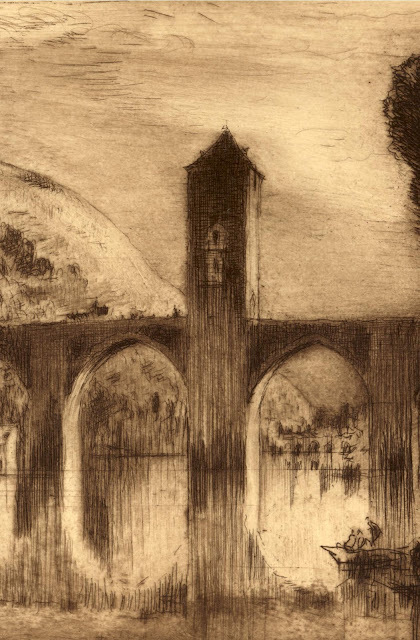 Here Brangwyn’s analytical eye defines his vision of the bridge and reflection with finely hatched strokes rendering the tones in pictorial space while his intuitive eye describes in a layering of richly inked lines his experience of a tree on the right in graphic space. What I find fascinating with this print is how literally the two spaces are so unapologetically abutted. From my standpoint, Brangwyn is making a forceful statement with this print that the world of concrete mortar and bricks is also inhabited with the shadowy world of a brooding mood. Condition: beautiful impression in pristine condition. I am selling this print for $310 AUD including postage and handling to anywhere in the world. Please contact me using the email link at the top of the page if you are interested or click the “Buy Now” button. Although the above discussion focuses on how Haden and Brangwyn integrated their divided ways of looking into a singular vision, for the viewer of their images the point needs to be made that composition also plays a significant role in how meaning is communicated. Again, like Daniel Heimlich’s arrangement of subject matter, these two artists’ disposition of pictorial and graphic space aligns well with the constructs of the Foote, Cone and Belding Grid: pictorial space is shown on the left and graphic space is shown on the right.